The School of Law welcomes proposals and applications for PhD study. 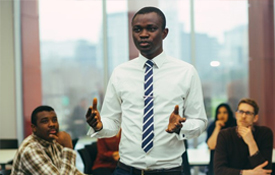 Munachiso is one of the University's best students, going far beyond his academic responsibilities to make a difference to international students. The LLM International Law analyses the how international law operates within the key areas of international human rights and international business law. The end of the Second World War has witnessed not only the creation of numerous international organisations, but also an increased level of global interconnection and the creation of common standards in many areas. International Law has become an important area of study because of the role it plays in regulating the relationships between states and how different states shapes their laws and legal systems. Therefore, the knowledge and understanding of the legal aspects of international law and how international law operates in the areas of international business and international human rights law is an important attribute that is highly regarded by prospective employers such as academic institutions, non-governmental organisations and charities, policy and research organisations, and international organisations. Our LLM International Law brings together different areas of international law and enables you to critically examine how international law operates within the fields of human rights and business law. The course examines international law with the underlying philosophy of providing a structured course characterised by sound theory and application to produce students capable of engaging with international institutions through their understanding of how law operates at the international level. Additionally, our LLM provides an opportunity to acquire, or build upon existing skills gained from your undergraduate course - enhancing employment opportunities in the legal profession and providing a basis for progression to doctoral studies. You will analyse and critically evaluate principle features of international law, including fundamental concepts, values, principles and rules, and the main institutions and procedures. You’ll also learn to evaluate complex legal issues, communicate complex and abstract ideas, and employ strategic transferable skills. You will learn from a dedicated and passionate teaching team, who have experience with the international human rights institutions and who have track record of research in the field of international business Law. You don’t need a degree in Law to be eligible to study this course. You will be given support through an Introduction to Law programme at the start of your studies. The course covers transnational jurisdictions, so it is international in scope. The course has flexible delivery methods to suit your location and when you are able to study. You can enroll as either an on-campus student, flexible/blended learning student or as a distance learning student. You can commence studies either in September or in January. Studying of the LLM International Law will provide you with an opportunity to engage with the work of the Law School’s Centre for Human Rights. You will have an opportunity to enhance your employability skills by completing a placement. Birmingham City University has just launched the UK's first Centre for Brexit Studies, researching all aspects of the UK's vote to leave the EU, including the impact it has on domestic law and legislation. You will be able to benefit from the newly-introduced postgraduate loans. For more information, visit UCAS. Join us for lunch to find out more about our postgraduate Law degrees, and how you can either continue your studies to take you to the next level or become an expert in a new field. Minimum 2:2 class UK degree or international equivalent in any subject area. This module examines the principles and operations of the most important elements of public international law. This is a potentially vast subject (in fact the subject of entire LLM programmes in its own right) so the module content will focus on the fundamental principles which underpin the legal relations between states. In particular the law of Treaties and the law of the United Nations will form the principal bases of study. This module enables you to gain enhanced knowledge and understanding of the techniques needed for advanced legal research. It serves a double purpose. As a foundation to other Level 7 modules in law, it supports you in acquiring the knowledge of research methods and skills in applying those methods required to succeed in postgraduate legal research – both in scholarship and for practitioners. The aim of this module is to provide a framework for you to undertake a substantial piece of disciplinary-relevant research the output of which may be either a placement, integrated project or dissertation. This is founded upon Birmingham City University’s teaching and learning philosophy which integrates theory into practice. This intellectually stimulating and exciting module engages with the law and practice of the United Nations for resolving international crisis situations. It provides students with critical knowledge of the UN. Charter, international humanitarian law and international human rights law, for solving humanitarian disasters. It presents an overview of the Charter of the United Nations and engages with the International Bill of Rights and associated international legislation. The module will provide an introduction to the two fields of women’s rights and children’s rights, looking at these in an international context. These will be studied within an overarching ‘rights’ context, allowing students to identify and explore differences and interrelationships between the two fields. In contemporary times there has been a large growth of international commerce which has resulted in an expanding use of cross border commercial transactions. This module aims to consider commercial law in the globalised world. This module considers the role of corporate structures and their global operations, and how these may lead to fraud, corruption and tax evasion. The role of intermediaries (such as banks, insurance companies, and law firms), tax havens, and tax evasion methods are considered in terms of how they may facilitate corporate criminality. Medical Law and Ethics is an optional module that forms one of your choices on the programme to provide an introduction for you to the ever-growing body of law, policy and ethics concerned with the global health and some of the ethical dilemmas advances in this field. This module examines the relationship between human rights and the rights of the environment. At a time when the effects of climate change are increasingly compromising the realisation of human rights a module such as this is essential to demonstrate the inter-dependence of environmental quality and human well-being. The aim of this module is to introduce you to a number of important themes in the area of international intellectual property law. More specifically, it is intended to provide you with an intellectually stimulating and academically rigorous education on the operation of intellectual property law at international level, and the challenges faced by the operation of that law. This module aims to inspire a new generation to rethink traditional approaches to conflict and conflict resolution. ADR is a fast-growing area and offers a challenging and satisfying career through an array of emerging professional roles. As a consequence, this module significantly enhances student employability. The importance of international criminal law has grown considerably in recent years. Similarly to domestic criminal law, international criminal law aims to prohibit and penalise certain actions when committed by individuals. Unlike domestic criminal law however, the crimes that concern international community are particularly serious: prohibitions such as genocide, crimes against humanity, war crimes and aggression involve conduct that is capable of affecting large numbers of the world's population. The module examines the international law relating to refugees and the free movement of people and how that law has been executed in certain municipal contexts. The development and scope of the relevant law will be explored including both ‘mandate’ refugees, ‘statutory refugees’ and regional developments. Competition law has affected trade and business in many and diverse ways this module will explore the impact that regulation has had upon multinational corporations and small and medium sized enterprises. The EU and the U.S will be considered alongside other international law in order to compare and contrast the legal systems. International firms are often subject to several international and domestic regimes which determine the acceptable standards of business behaviour. Corporate compliance revolves around how firms respond to the legal and regulatory requirements applicable to their business activities. This module aims to provide a theoretical foundation for compliance requirements. Hence, the module provides a contextualised discussion on the theoretical justifications for regulatory intervention in business activities. Our LLM is taught by an outstanding team of professionals. You must complete 6 six taught modules and either a dissertation, project or placement. Our approach is experiential and practice-led and will give you opportunities to apply your learning and to develop skills to enhance your employability and career. This programme will support you in becoming an independent learner during the teaching, learning and assessment process. During induction we will support you in developing key study skills. Throughout the programme you will have the chance to complete activities which will enable you to practice legal skills including legal research, problem-solving, advocacy and drafting in order to develop and practice. These activities also enable you to practice transferable skills including structuring and presenting arguments, working independently or in teams to complete tasks, oral and written communication, and time management. These skills will be valuable whatever your final choice of future career. During the September and January terms you will study three 20-credit modules, thereafter you will study one 60-credit module: the LLM dissertation/placement/project module. The 20-credit Advanced Legal Research Methods module (studied in the January term) is delivered online via the Virtual Learning Environment, providing maximum flexibility. There is the opportunity to undertake a placement abroad as an alternative to a dissertation. The LLM enables students to progress onto doctoral studies. A number of LLM studies have successfully obtained funding from the Midland 3Cities Doctoral Training Programme. You will have the opportunity to undertake a placement as an alternative to a dissertation. In addition we have active, student-led Legal, Mooting and Debate Societies. Our Student Mooting Society is one of the most successful in England, with our students reaching five finals in the past six years, regularly beating teams from some of the country’s most prestigious universities. We also have a staff and student led Pro-Bono Unit that provides legal advice to the public. The facilities at the Curzon building include two bespoke Law Courtrooms, replicating a Crown court and a Magistrates court. These rooms will play a key part in your learning experience, allowing you to try your hand in mock court cases, whilst also being the venue for our Mooting and Debating Societies. On top of this, the Curzon building houses an extensive Law library, with books covering every aspect of Law history. Jon Yorke is the Professor of Human Rights in the School of Law and is the Director of the Centre for Human Rights. His qualifications include LL.B. (Hons) (BCU), LL.M. and Ph.D. (Warwick). He currently teaches LL.B. International Human Rights and LL.M. Human Rights in the Wider World. Professor Haydn Davies has taught and researched environmental protection (both technology and law) since the 1990s. He is currently the assistant vice chair of the UK Environmental Law Association, and co-convenor of the Welsh Working Party. Chipo Mwale is Programme Director for LLM International Human Rights and also a Senior Lecturer in the School of Law. She currently teaches the following courses: LL.B. ; LL.M. Corporate and Business Law; LLM International Human Rights; BA Joint Honours Programme (Business Law Pathway). Mark Eccleston-Turner is a Lecturer in Law. His main research interests are in global health law, medical law and public law. Mark lectures in Public Law and English legal System and Practice. Safina Din is a Senior Lecturer in Law who teaches Skills, Criminal Law, Human Rights Law and Asylum and Immigration on the LLB programme. She also teaches Legal Processes with Criminal Law on the BA Criminal Investigations Programme and Refugees and the Law on the LLM IHR programme. Dr Olia Arustamyan is a Lecturer in Law. Her main research interests are in philosophy of law and moral philosophy more generally. Olia lectures in criminal law and criminal evidence at undergraduate level, and human rights law in the LLM. Dr Stephen Swann lectured at Oxford Brookes University, the University of Leicester and the University of Dundee before becoming a teaching and research fellow at the University of Osnabrueck, Germany. He has been a Research Assistant within the Property and Trust Law Team at the Law Commission. Dr Ozlem Ulgen is involved in drafting legal and ethical rules governing lethal autonomous weapons at the UN Group of Governmental Experts on Lethal Autonomous Weapons Systems. Suresh Birdi currently teaches European Union Law, Law and Institutions of the European Union, International Trade and Dispute Resolution, Business & Human Rights, and Advanced Legal Research Methods for the School of Law. Ewan Kirk is currently the Senior Personal Tutor on the LLB Programme within the Law School. Ewan currently teaches EU Law and Intellectual Property Law at undergraduate and postgraduate level. His areas of research interest include intellectual property law and internet law.